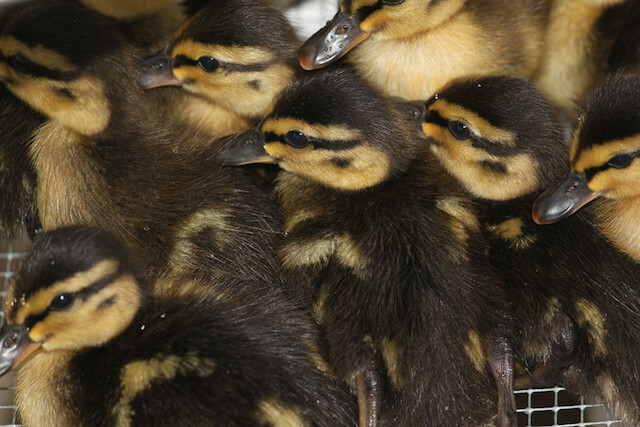 How many baby birds do we have in care right now? A lot. 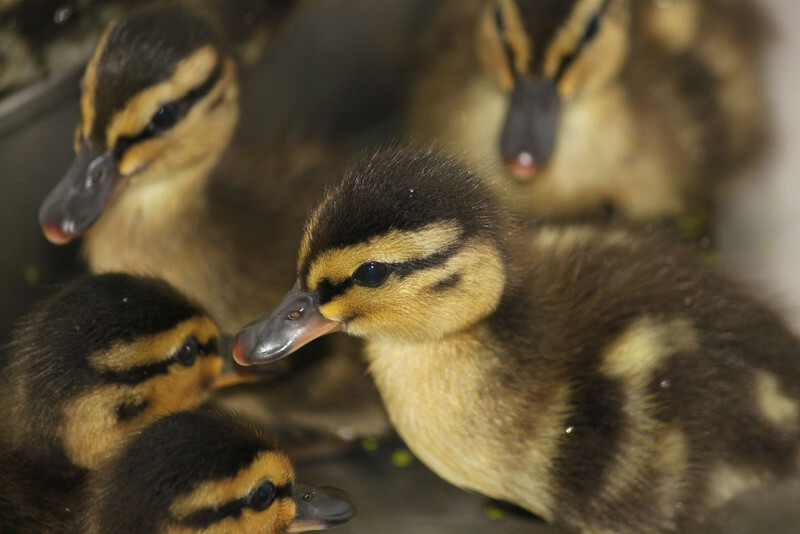 For instance: By last count at International Bird Rescue’s San Francisco Bay center, our team was caring for over 70 Mallard Ducklings, as well as baby Black-crowned Night Herons, Green Herons and mergansers. 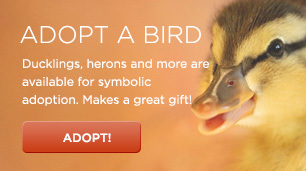 And the numbers continue to climb as orphaned birds are brought to our center from all over Northern California. 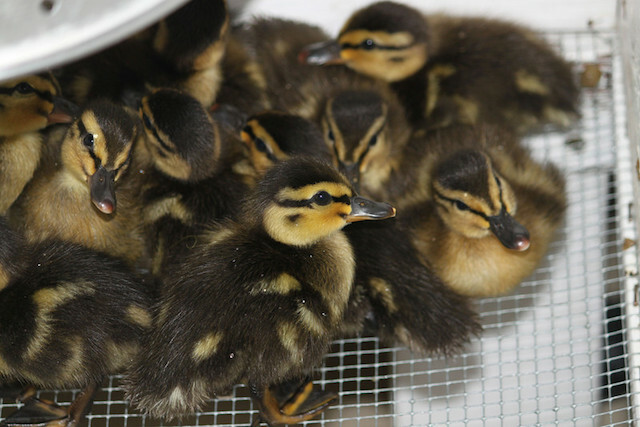 On Saturday, we received a phone call about a mother Mallard Duck and her eight ducklings, found in downtown Fairfield, CA at a local Sears Auto Shop. The workers there were concerned to see mom and her clutch journeying straight across a busy four-lane boulevard. We’ve seen this scenario before, and it’s always heart-stopping (take, for instance, this now-famous video of a mother and clutch crossing a freeway via CNN). Animal Control officers jumped in to help along with one of our local volunteers, who had stopped by that area. Together they were able to catch the mother duck and her ducklings. As it happens, this mother Mallard has a federal band on her leg, which we found was put on the bird last year — with the exact same rescue and story. 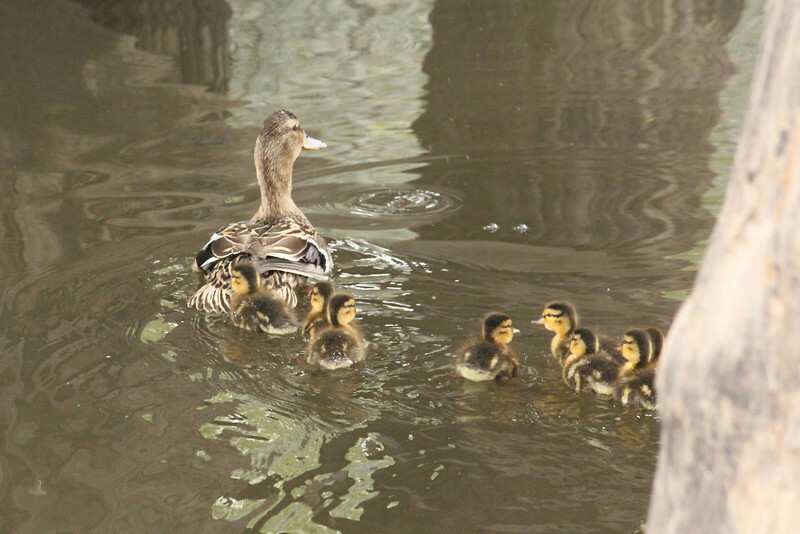 She had tried to take on the busy traffic with her ducklings and was ultimately rescued and relocated then, too. She survived yet another year, only to find herself in the same situation, stuck in the middle of an urban area with ducklings in tow. 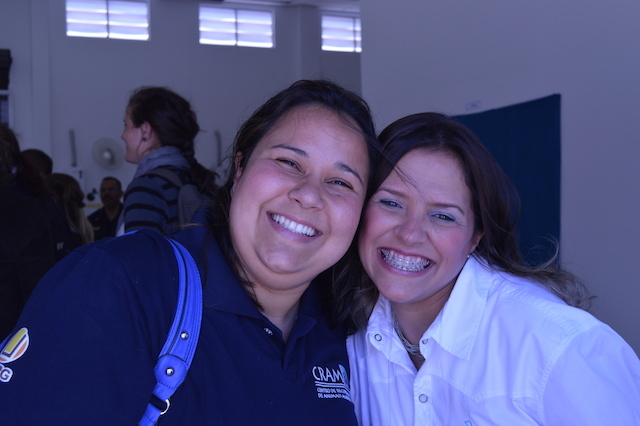 Thankfully, the birds were all healthy and relocated to a rural area to complete their journey. 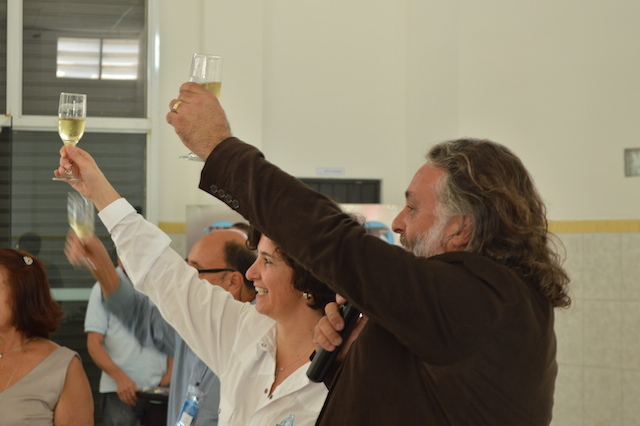 Below, a parting shot of their release. 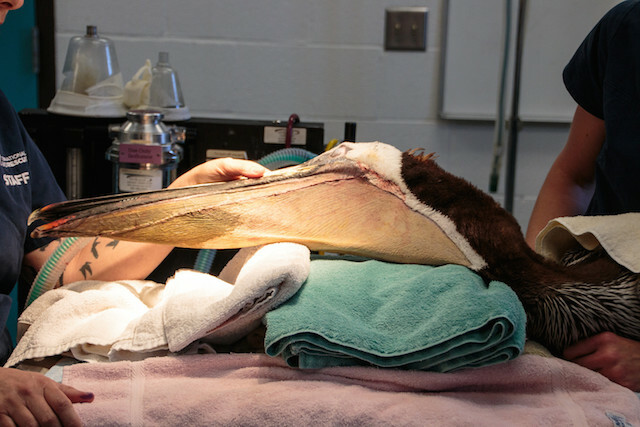 Dr. Rebecca Duerr with “Pink” during the animal’s first surgery, photos by Bill Steinkamp. 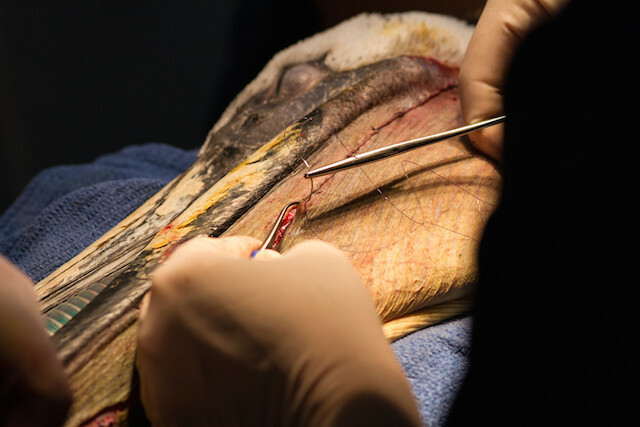 The adult California Brown Pelican mutilated by an unknown suspect has completed a successful first surgery to repair an extensive pouch laceration, one consistent with human-caused injury. 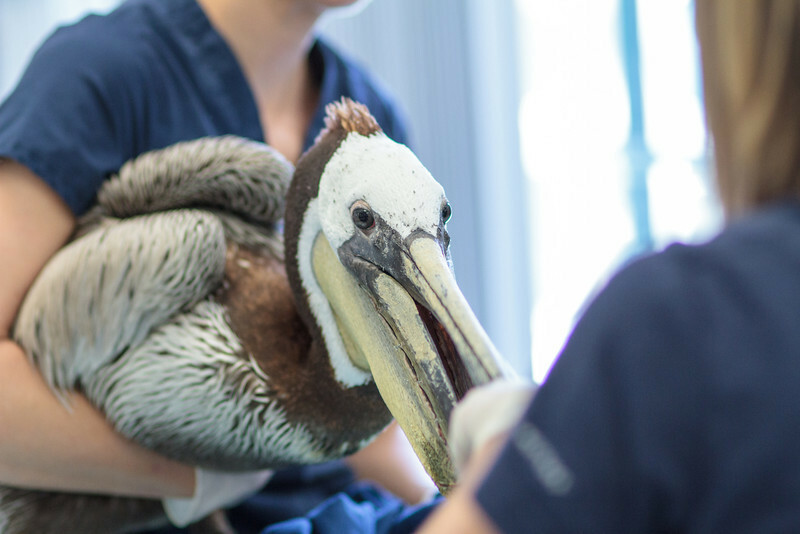 Click here for the backstory on this bird, nicknamed “Pink” for the colored leg band we assigned the animal upon arrival at our Los Angeles center. On Sunday afternoon, IBR veterinarian Dr. Rebecca Duerr performed the three-hour procedure assisted by Los Angeles center rehabilitation staff. 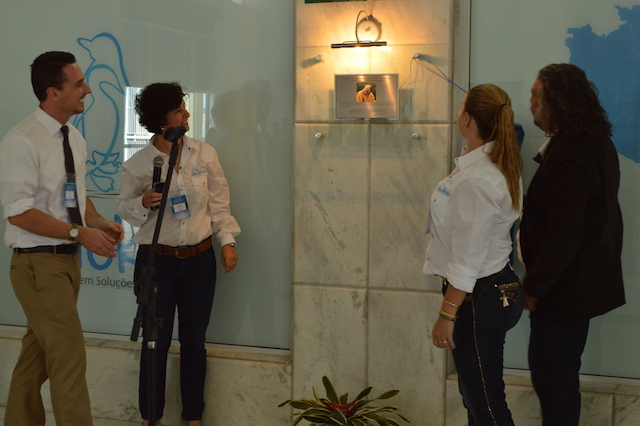 We are hopeful for this bird’s recovery, though multiple surgeries and extensive rehabilitative care are needed. Another bit of good news: the Animal Legal Defense Fund announced today that it has doubled its commitment to a reward in this case, which now totals $10,000 and includes the support of concerned citizens in the Los Angeles area. The U.S. Fish and Wildlife Service (USFWS) currently is seeking information on this federal crime, which is punishable by a fine of up to $15,000 and a jail sentence of up to six months. Anyone with information leading to the arrest and conviction of the person or persons responsible for the mutilation of this bird should contact USFWS at 310-328-1516. Tips may be given anonymously. 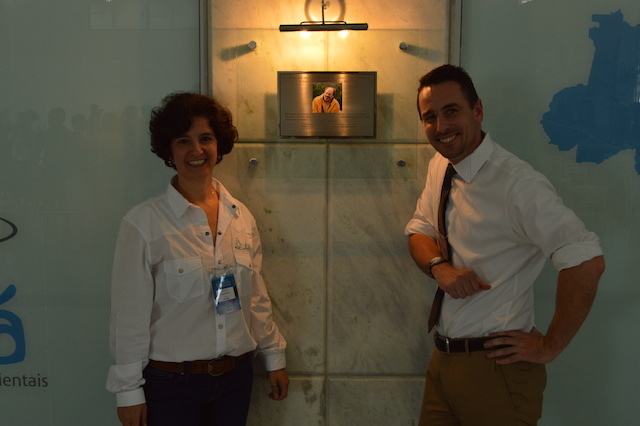 IBR depends on the support of the public to care for animals injured in cruelty incidents, as well as those harmed by fishing wound and other human-caused injuries. 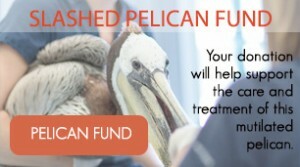 To make a donation, please click on the “Slashed Pelican Fund” image to the right. Thank you so much. We don’t typically name our patients, but the nickname “Pink” stuck. 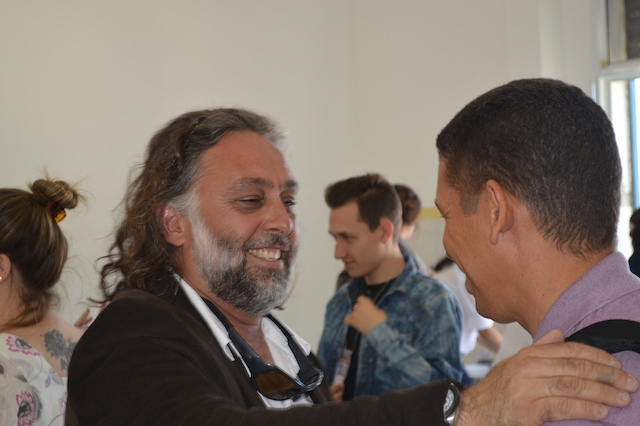 That’s what we overheard a TV news cameraman say on Wednesday while filming a victim of animal cruelty, now recuperating in the aviary at International Bird Rescue’s Los Angeles center. 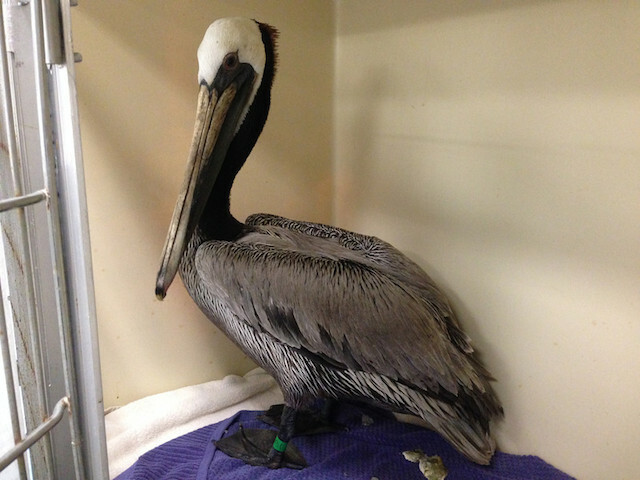 You may have seen stories about this adult Brown Pelican on the news in the past few days. 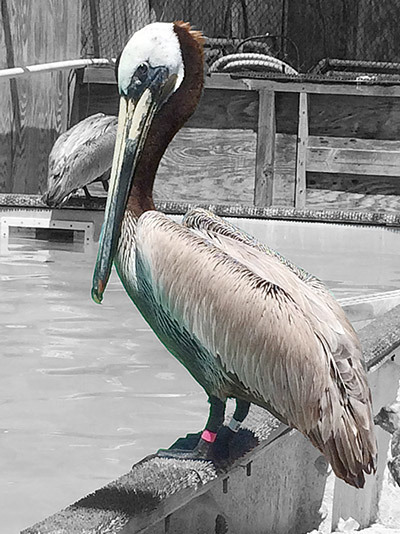 Here’s a recent photo of the bird, shown with a pink plastic leg band. Though we don’t typically name our patients, the nickname “Pink” has stuck. And you can help Pink get a second chance. A few days ago, Pink was found in Long Beach, CA with a severe pouch laceration leaving the bird unable to feed. Sadly, the wound is consistent with human-caused injury. It’s the worst deliberate pouch slashing we’ve ever seen. 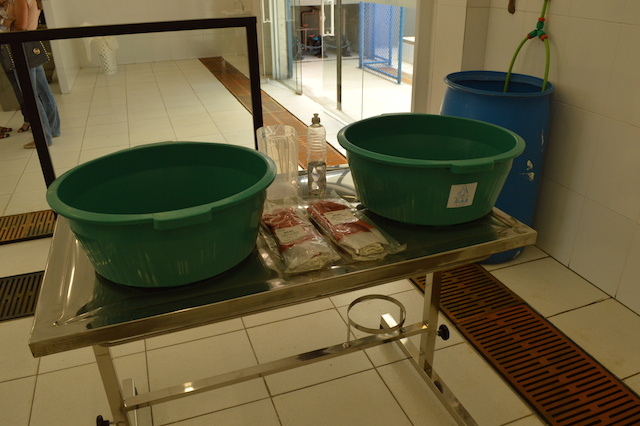 We’re pleased to let you know that Pink has been able to feed on plenty of sardines over the past few days, thanks to the temporary staples placed in the animal’s pouch wound. 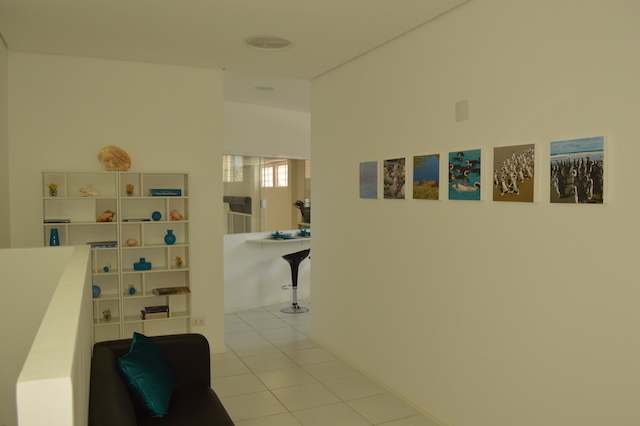 On Sunday, our veterinarian will perform the first of what could be multiple surgeries. 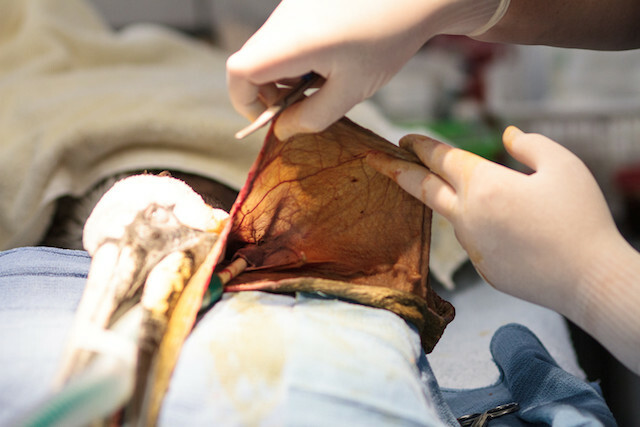 “Pink” may need multiple surgeries to repair a slashed pouch. When you give to support Pink, you’re not only giving this beautiful pelican a second chance. 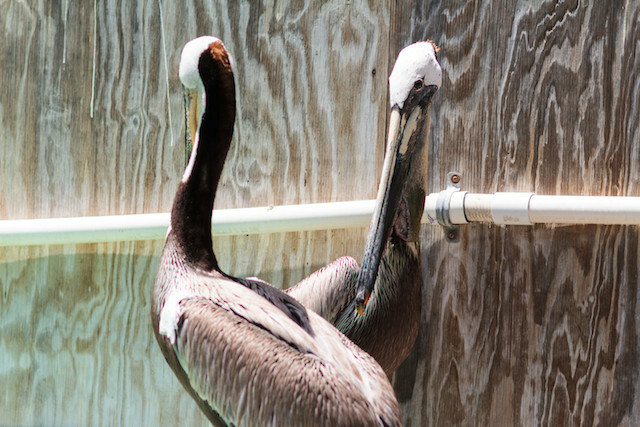 You’re also helping to support the 200-600 pelicans our L.A. wildlife center cares for each year: oiled, injured and even abused by humans. We don’t know why someone would do this, but we encourage anyone with information on this attack to call US Fish and Wildlife at 310-328-1516. A $7,500 reward is currently being offered for information leading to the arrest and conviction of those responsible for this crime. Tips may be given anonymously. P.S. – Please visit birdrescue.org for regular updates on Pink in the coming weeks. 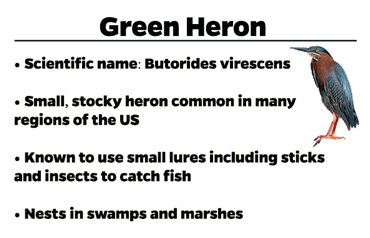 Anyone with information that might lead to the arrest and conviction of those responsible for the mutilation of this bird should contact the U.S. Fish and Wildlife Service (USFWS) at 310-328-1516. 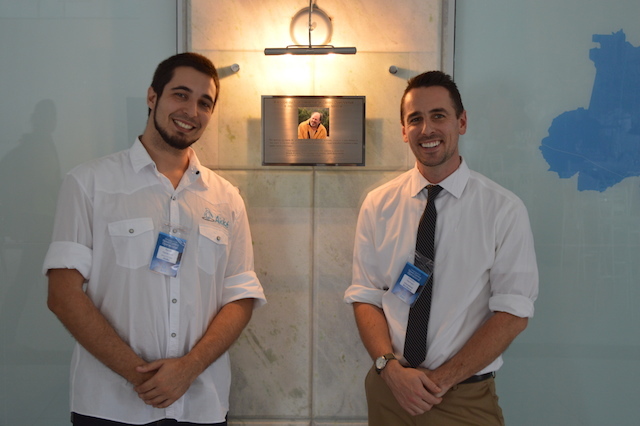 Currently there is a $7,500 reward in this case. 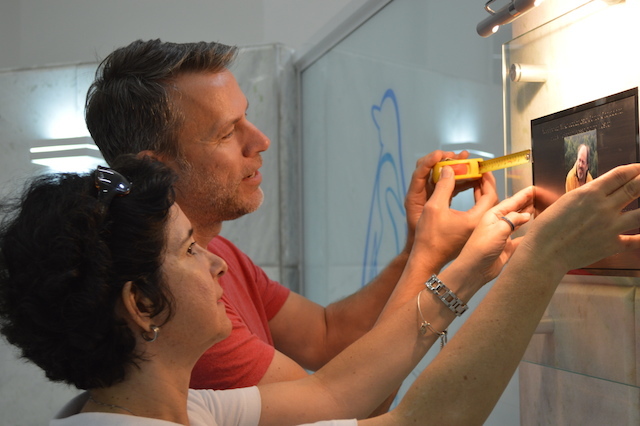 Over the next few weeks and months, we’ll be following this bird’s journey through rehabilitation. If you’d like to help, you can make a donation at any level by clicking here. 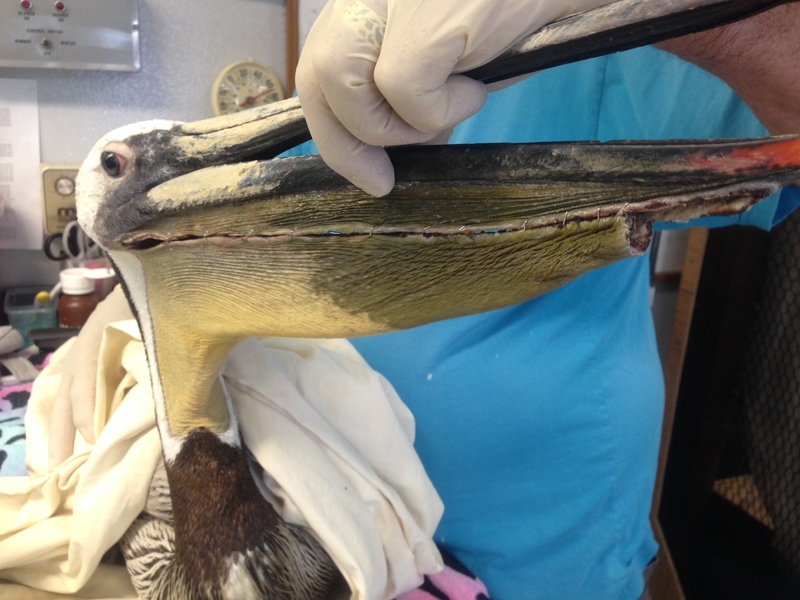 The first of what will likely be multiple surgeries for this bird is scheduled for Sunday. More media coverage of this case can be found here. 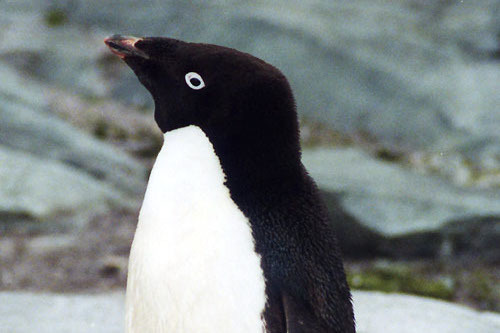 • Today is World Penguin Day. In celebration of these wonderful birds, NBC News reports on a new program using satellite- enabled cameras to track birds on Antarctica’s Yalour Islands. Update, May 1: An anonymous supporter, the Animal Legal Defense Fund, along with the generous support of individual donors including Lourdes Rivas & Patti Ballaz, have increased the reward to $20,000 for information leading to the arrest of those responsible for this horrific pelican attack. 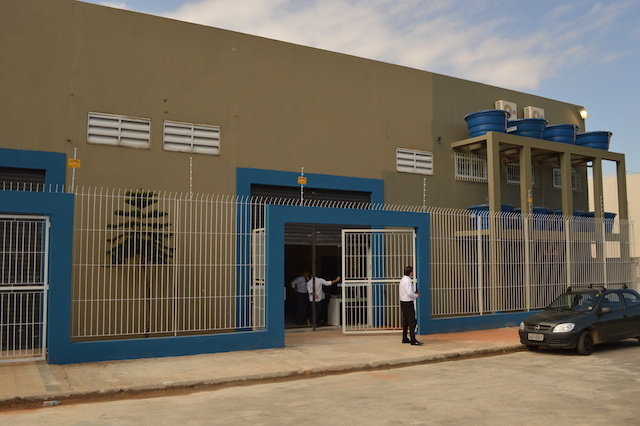 Anyone with information that might lead to the arrest and conviction of the suspect or suspects should contact the U.S. Fish and Wildlife Service (USFWS) at 310-328-1516. You can also make a donation by phone. 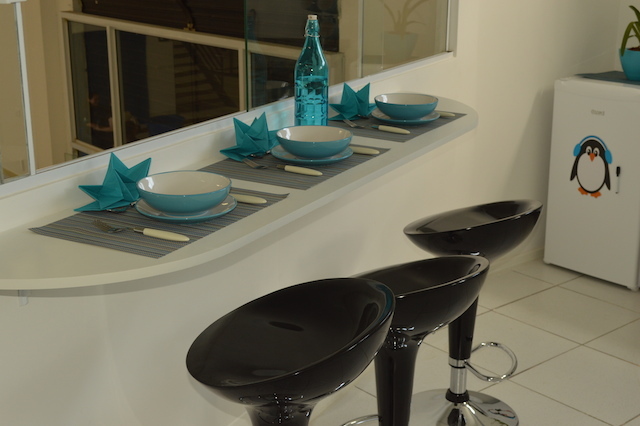 Simply call us at 510-289-1472 and we’ll handle your gift right away. This Brown Pelican with a severe pouch laceration injury was found and captured last week at 5400 Ocean Blvd in Long Beach before transfer to our Los Angeles center. 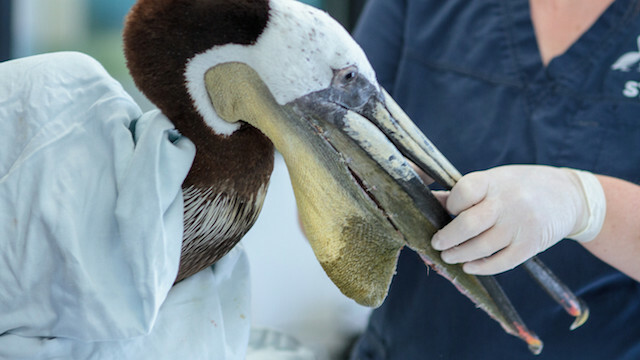 The laceration runs all the way around the pouch, and as a result the pelican was unable to self-feed. 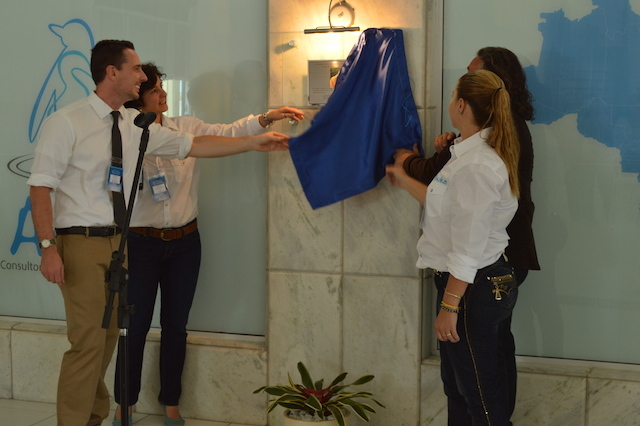 Our center team has placed temporary staples in the pouch to allow the bird to self-feed and stabilize. 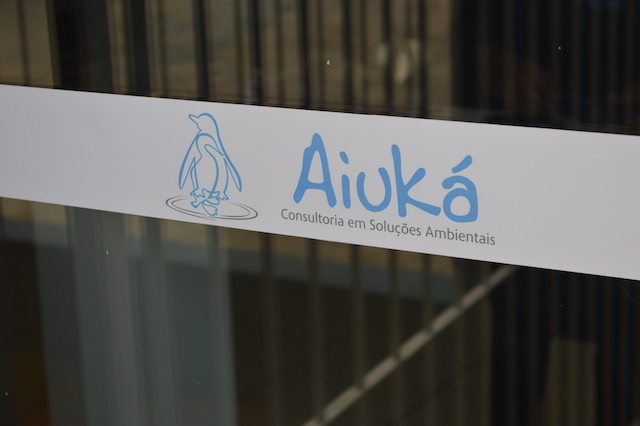 The bird is currently living in our small aviary awaiting surgery to repair the pouch. Jay Holcomb, the rescue organization’s director, said fishermen sometimes injure birds because they are falsely seen as competition. Anyone with information that might lead to the arrest and conviction of person responsible for the mutilation of this bird should contact the U.S. Fish and Wildlife Service (USFWS) at 310-328-1516. We’ll keep you posted on this bird’s condition. Read the full press release on this incident here. Do not adjust your screen settings. 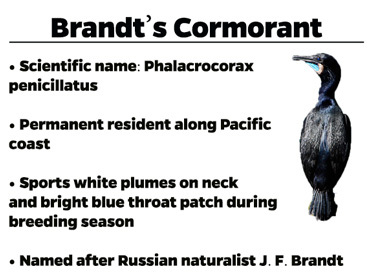 The bright blue throat patch on this Brandt’s Cormorant is the real deal, and part of the bird’s breeding plumage, which also includes wispy white plumes on its neck as you can see here. 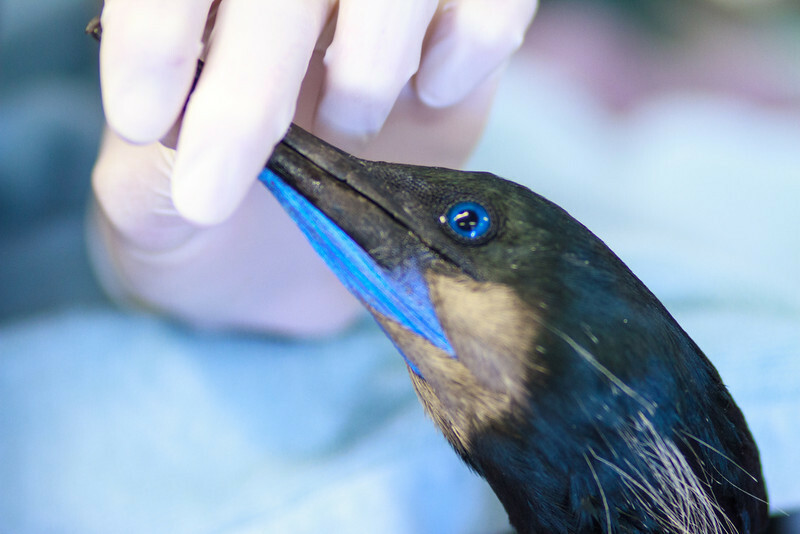 This cormorant didn’t attempt to fly away when picked up by Manhattan Beach Animal Control last Saturday, volunteer coordinator Neil Uelman reports. When it arrived at our Los Angeles center, the bird showed signs of neurological issues and was very unstable when walking or standing. In recent days, this week’s featured patient has slowly improved and began to self-feed a few nights ago. 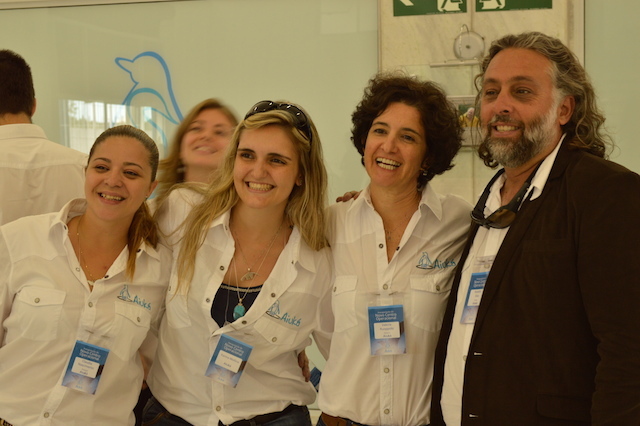 Our L.A. center has a growing number of seabirds in care; check out the latest tally here. 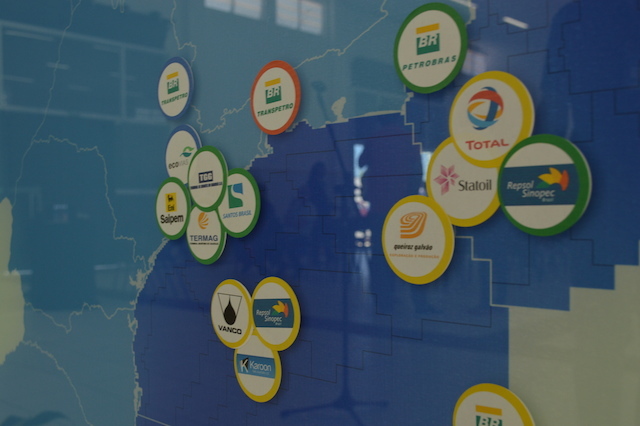 In a statement, BP said that the Coast Guard ended patrols on Tuesday of the final three miles of affected shoreline in Louisiana. 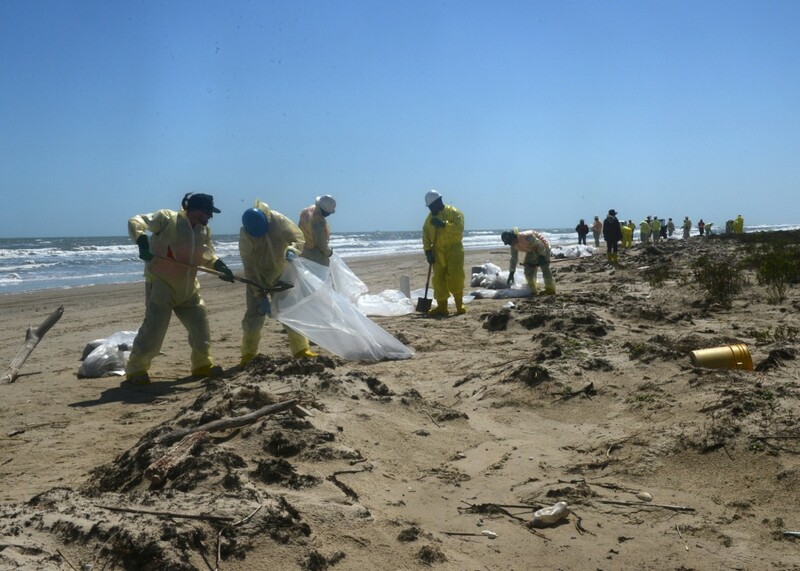 Still, the Coast Guard stressed that a more narrow cleanup response would continue and that crews would remain on the Gulf Coast to respond to new reports of oil. Teams will be positioned to provide a rapid response when they are needed, the Coast Guard said in a statement on Tuesday night. • In a brilliant program combining conservation, citizen science and metadata (used for non-nefarious purposes, for once), the Nature Conservancy-backed BirdReturns program pays farmers in the Central California valley to keep rice fields flooded for the welfare of Dunlins and other migratory shorebirds suffering as the result of the state’s epic drought. 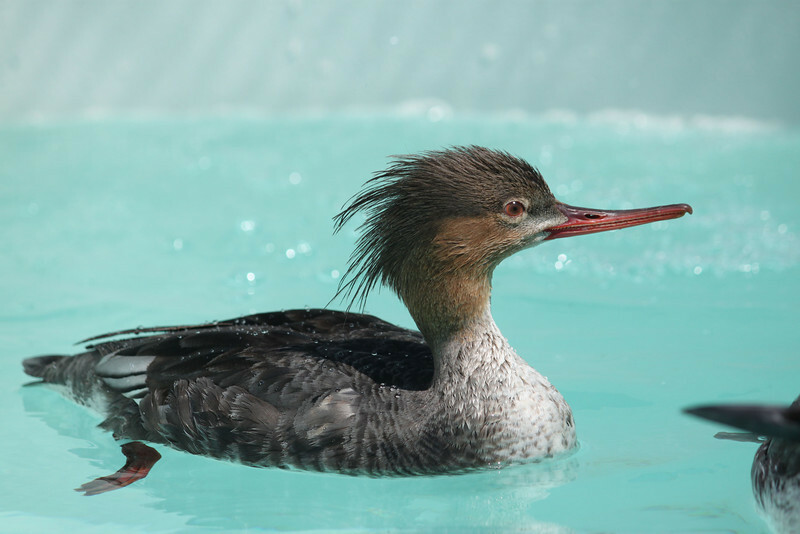 This female Red-breasted Merganser was found at Main Beach in Santa Cruz on April 6 and was transported to us via our wildlife partners at Native Animal Rescue on Saturday. 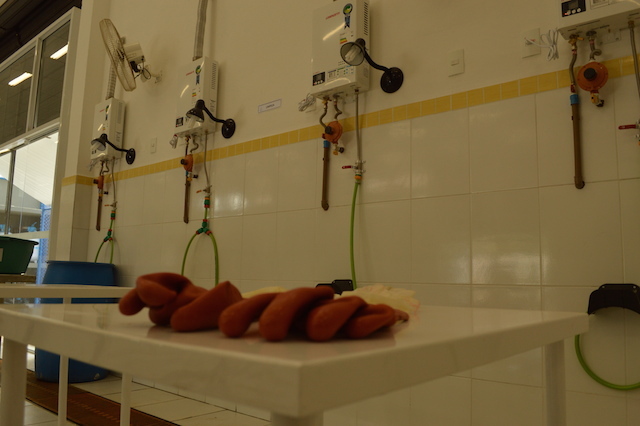 Upon intake, she was found to be emaciated with poor feather quality, and was suffering from toe abrasions, a likely result of being out of water for multiple days, rehabilitation technician Isabel Luevano reports. 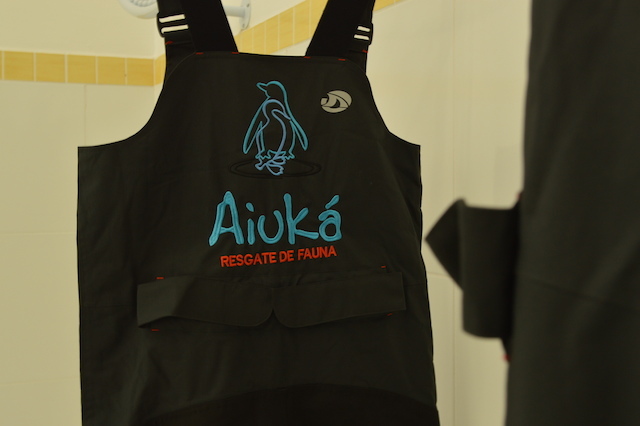 She also lacked crucial waterproofing and was determined to be contaminated from fish oil and feces. 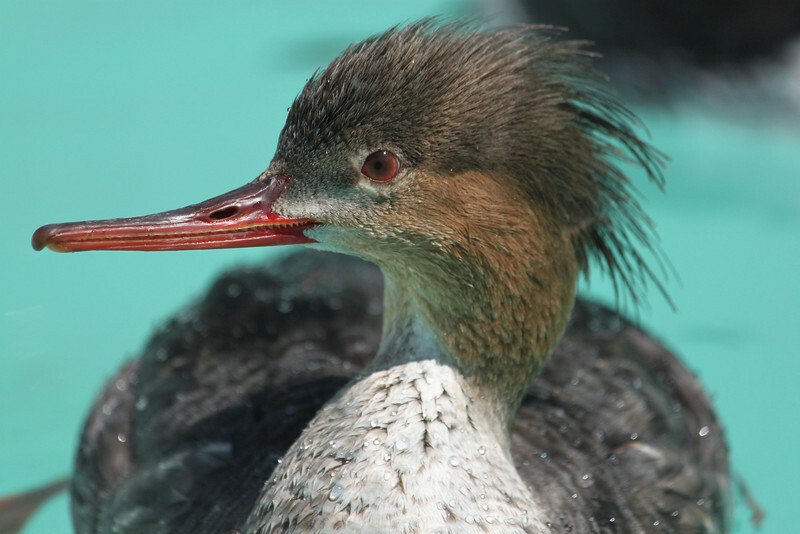 The merganser received a quick wash on Monday and is now acclimating to an outdoor pool, where she’s gaining wait and eating plenty of fish. Our Los Angeles team has been dealing with an array of oiled aquatic birds in recent days, from Common Murres to a very large Common Loon. 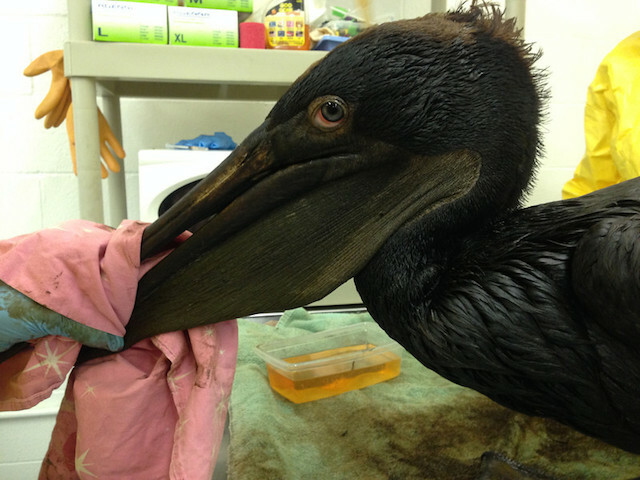 And now, this Brown Pelican, brought to us 100% oiled by a contaminant with the consistency of motor oil. Rehabilitation technician Kelly Berry reports that the adult female was found on April 10 at Faria Beach near Ventura and Santa Barbara, CA. 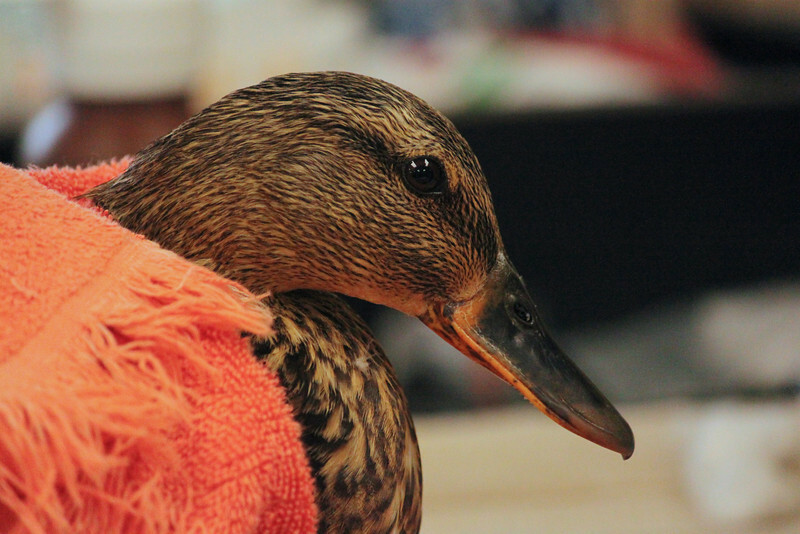 The bird was initially taken to Santa Barbara Wildlife, which then transferred this patient to us. 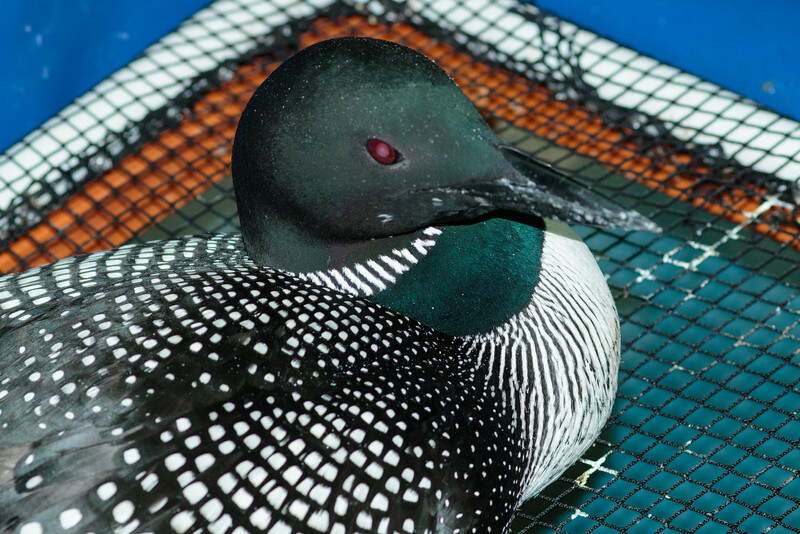 Our patient of the week is this stunning Common Loon in breeding plumage, currently in care at our Los Angeles center. 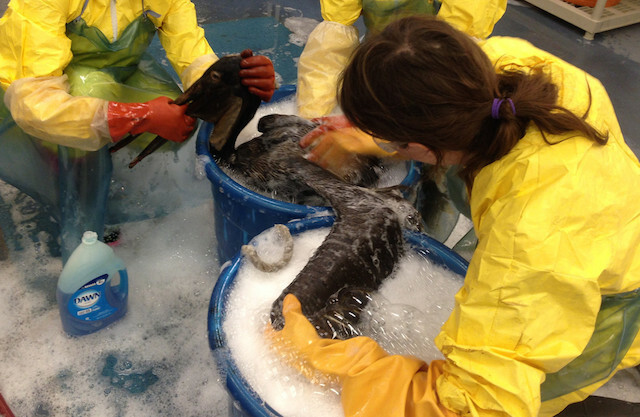 On April 7, the bird was found oiled and beached along Refugio Beach in Lompoc, CA and was immediately transferred to our wildlife partners in Santa Barbara. 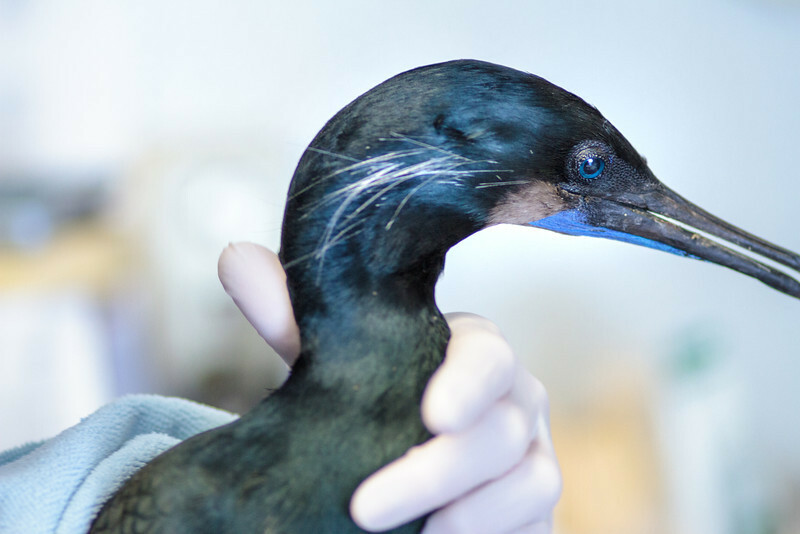 A day later, the loon was transported to our Los Angeles center, which currently has a wide array of diving birds in care, from Eared Grebes to Common Murres. Volunteer and outreach coordinator Neil Uelman says it’s a very large loon as well, weighing in at 3,296 grams, or about 7.5 pounds. 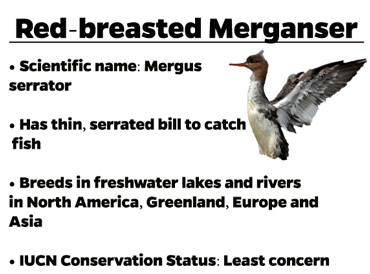 The loon was about 50% oiled upon intake; we’ll keep you posted on its condition. 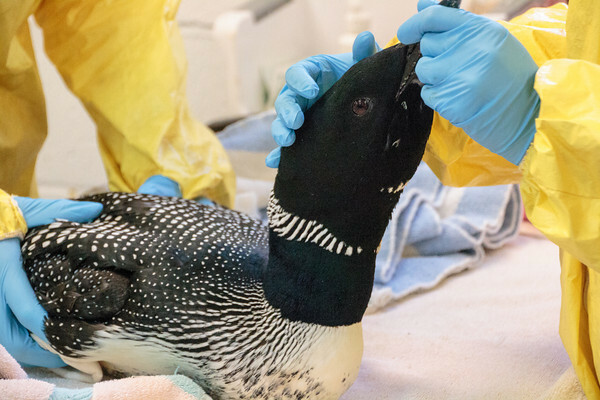 Like other diving birds, Common Loons are susceptible to becoming oiled, whether by natural seepage or human-caused events.Check out wash photos here of another oiled Common Loon cared for in the last year by our L.A. center team. 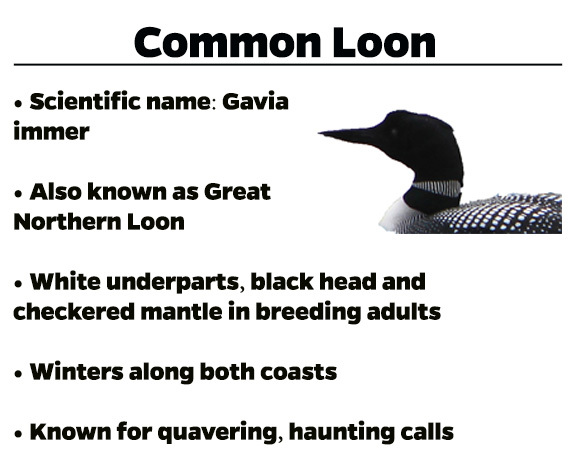 Also, this loon is still looking to be adopted! 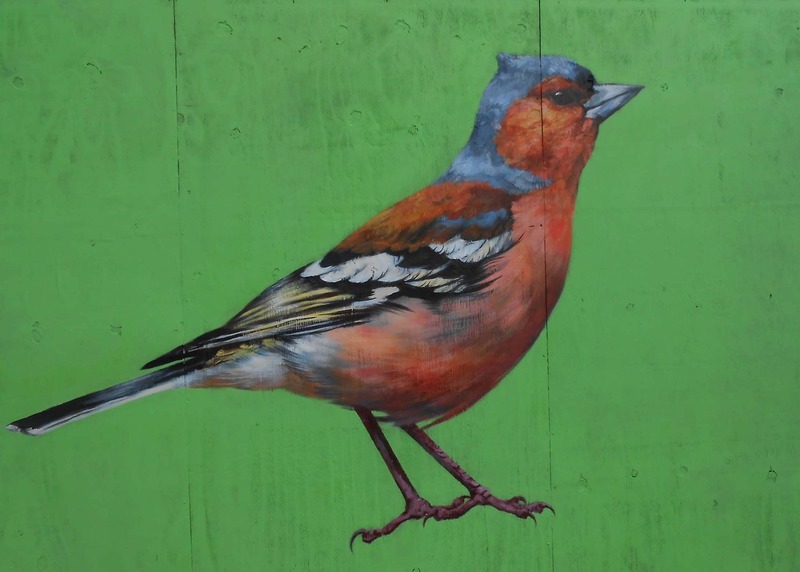 Click here if you’d like to make a symbolic adoption of this beautiful bird. 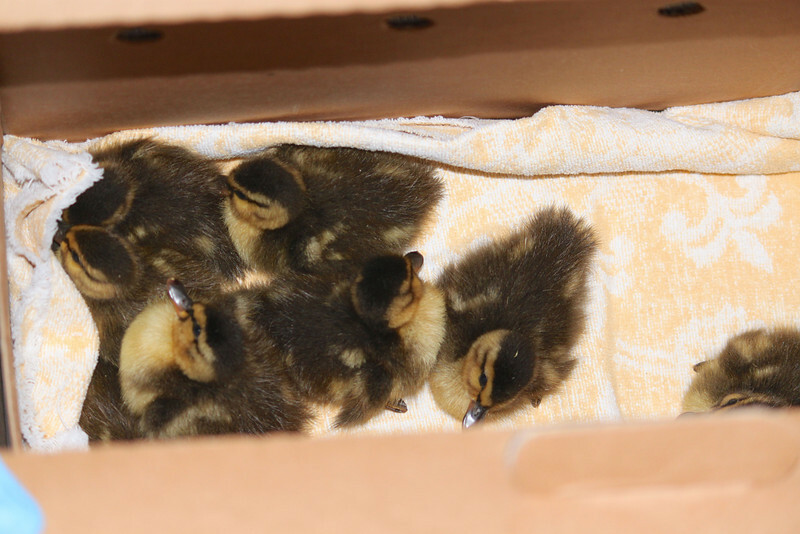 Over the past week, both International Bird Rescue’s wildlife centers in California received orphaned baby birds. 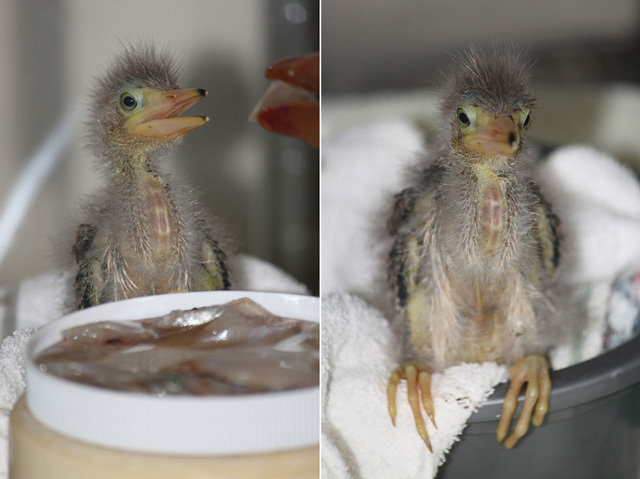 Our Los Angeles center is caring for four orphaned ducklings, while our San Francisco Bay center has Canada goslings, Mallard ducklings and a Green Heron, shown above being fed via puppet surrogate. 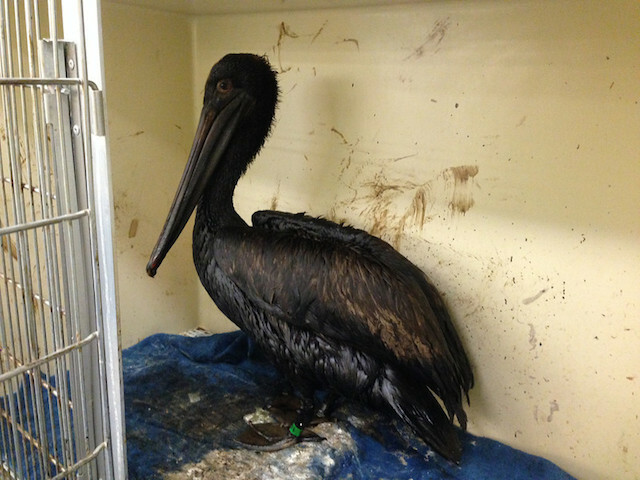 This patient was found in Discovery Bay, CA with injuries, and re-nesting was unfortunately not an option. 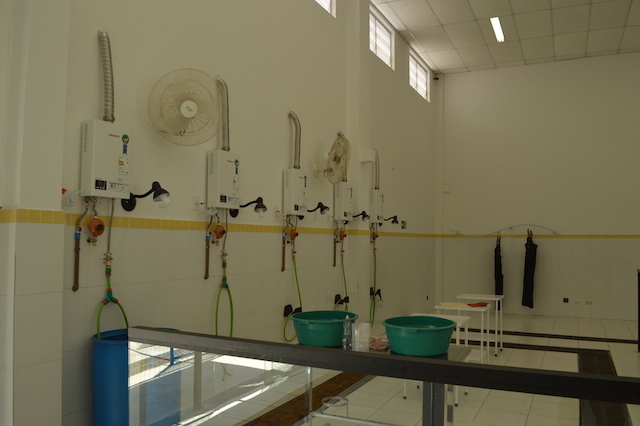 The heron is currently in an incubator within the center’s ICU, which is kept at a very warm temperature. 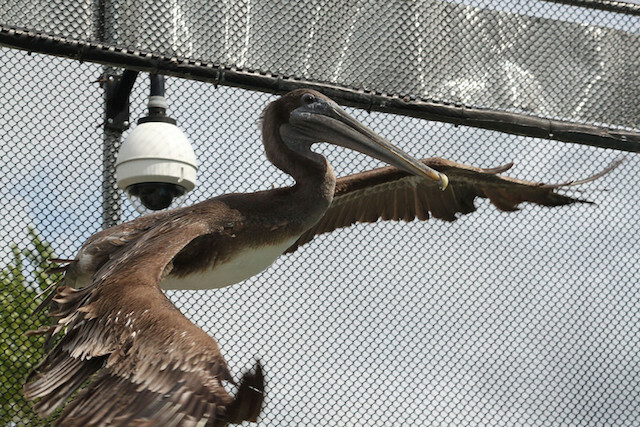 During clinic hours, you can catch him/her on our live BirdCam. Remarkable healing is commonplace at our wildlife centers. 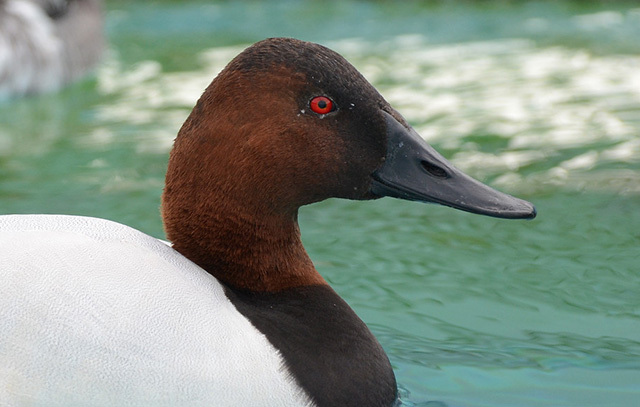 Case in point: this male Canvasback at our San Francisco Bay center. He arrived with severe hock lesions, as well as a broken toe. For weeks, you may have seen this diving duck on our live BirdCam, wearing a waterproof “shoe” to protect the healing fracture while he comingled with grebes and a Bufflehead. 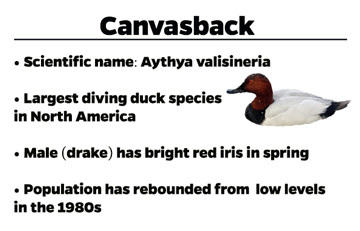 Despite these severe injuries, the Canvasback has done extremely well in care, and we’re optimistic about eventual release. 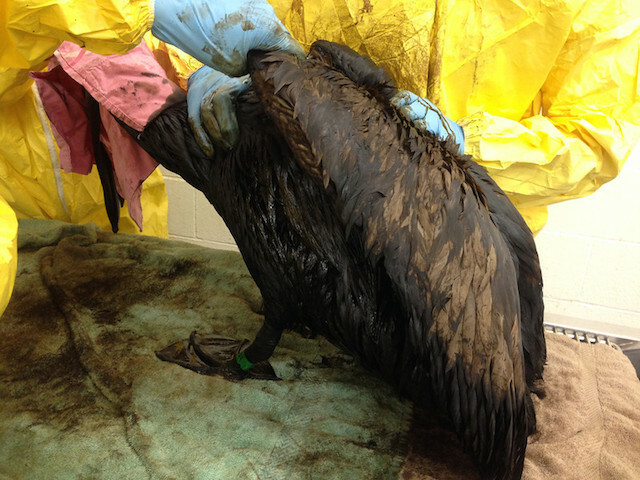 • Hundreds of dead, oiled birds continue to be found on the Texas Gulf Coast following an oil spill near Galveston late last month. 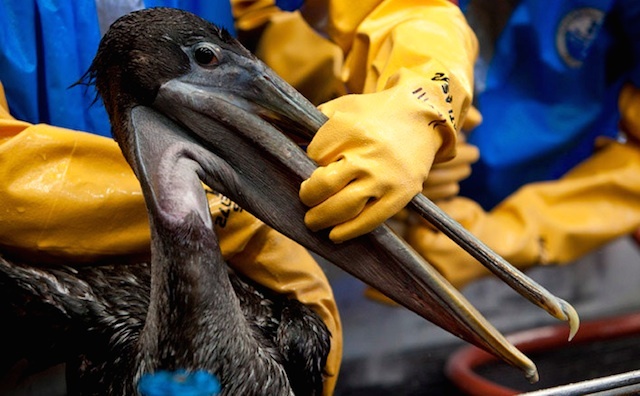 The Texas Tribune reports that as of yesterday, 329 oiled birds had been found from Galveston Bay to North Padre Island over 200 miles south. 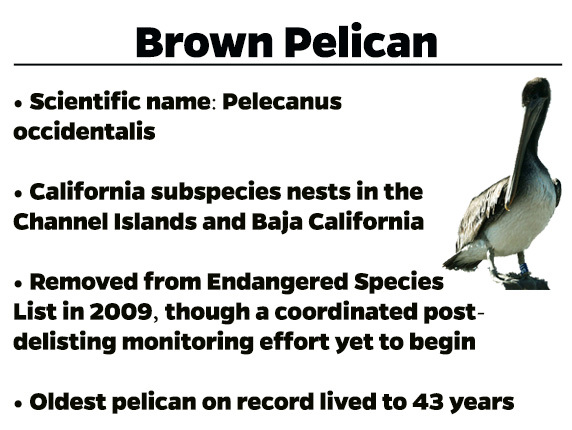 Recently, we wrote about pelican conservation on the Pacific Coast in this Los Angeles Times op-ed. 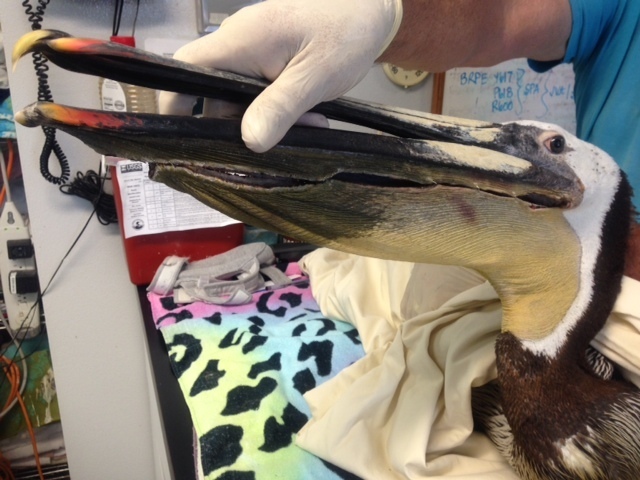 The star of the piece was Brown Pelican Red #308, who came to us several months ago with a severe injury to his left patagium (a fold of skin on the leading edge of the wing) caused by an embedded fishing hook. 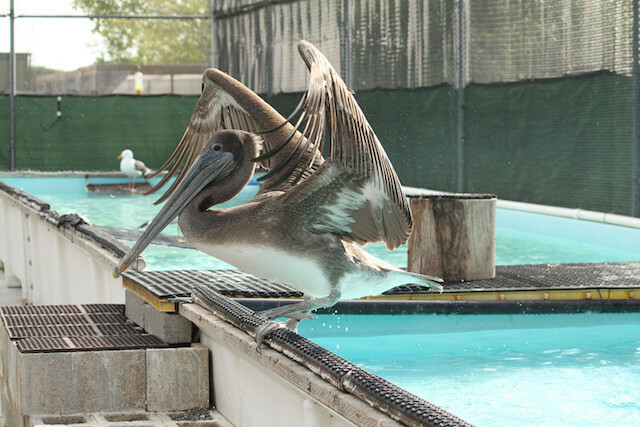 After months of care, our team is giving him regular flying workouts in the pelican aviary, and with each pass, he’s getting stronger. It’s a remarkable testament to the resiliency of this iconic species. 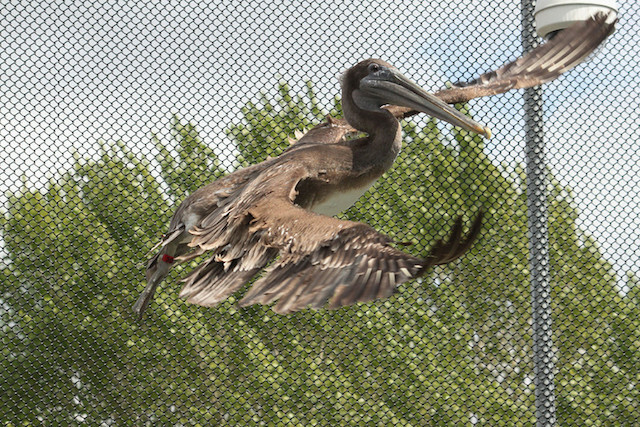 Cheryl Reynolds recently took these snapshots of the pelican testing his wings out in the aviary.